Ever since the plan was announced for the Allt Duine wind farm in the Monadh Liath hills on the very edge of the Cairngorms National Park I had intended to visit the region and try and gain a feel for the landscape. I had been this way in the past, most memorably on ski tours, an activity for which the Monadh Liath are well-suited, but I only had a hazy memory of the nature of the land around the Allt Duine. This is not surprising as the Monadh Liath is a subtle landscape, one of curving gentle slopes, vast sweeps of moorland, lonely pools and trickling burns. The attraction is in the wildness and remoteness, the sense of space and freedom rather than dramatic peaks or spectacular rock scenery. I approached the area from Strathspey, climbing up through attractive pine and birch woodland on tracks and paths to the Allt na Cornlaraiche, which I followed out of the woods and onto open moorland. Above the stream I reached the border of the national park on the watershed between the rivers Spey and Dulnain. The wind farm with its 21 turbines reaching a height of 125 metres would fill the whole area in front of me and away to the west. What I saw was a spreading, quietly beautiful, complex tangle of water and hill, heather and grass, land and sky. A natural place, home to birds, animals and plants and with a wonderful feel of quietness and peace. Clouds raced over the sky, breaking in waves on the hilltops. Just to the east 824 metre Geal-charn Mor, the highest hill in the area, was shrouded in greyness. I climbed to an indistinct top, marked on the map as Carn an Fhuarain Duibh, and looked out on this wild world. A few tall thin lines caught my eye. Anenometers, placed to measure the wind and show this is a suitable place for industrialisation, the first creeping signs of the proposed destruction. For this land, whilst looking rugged and tough, will be changed utterly if the wind farm is built. There will be no more peace, no more quiet. The sounds will no longer be those of wind and water and the calls of moorland birds. Instead the view will be filled with metal monsters towering into the sky and the scars of the bulldozed roads built to service them and the sounds will be the whirring of the turbines. I gazed over the land, wondering how long this would be here and whether people in the future will have the opportunity to experience this wild beauty, then I turned and descended back into the woods. The sky had stayed overcast and there seemed little chance of a sunset but as I walked through the winds a sudden burst of bright orange and red lit up a patch of clouds. A few minutes later and it had gone. 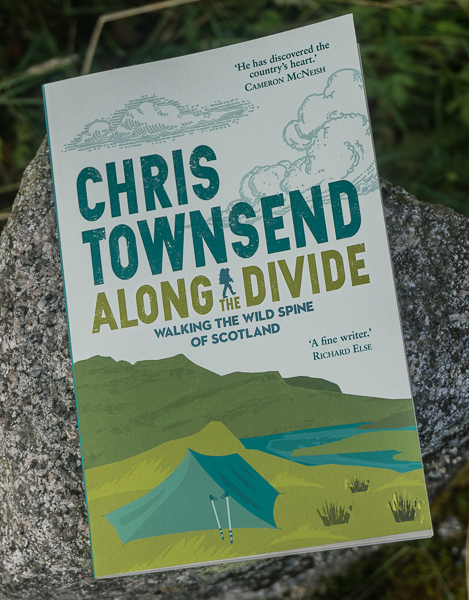 I have written about the Save the Monadhliath Mountains campaign before. Support is still needed. Please sign the petition. If in doubt as to the impact of this wind farm have a look at Scotland-Landscapes, where there are carefully prepared maps showing just what is proposed, the area it covers and how it will be visible from many other places including the northern Cairngorms. Thanks to Alan Sloman for discovering Scotland-Landscapes. I walked through the Monadhliath on this year's TGO Challenge, right through the centre of the proposed Allt Duine Wind Power Station. From the bothy on The Dulnain there is a magnificent view right up the lenght of Allt Duine, the lttle burn at the centroe of the scheme. It is a magnificent empty place, a place of quiet solitude. 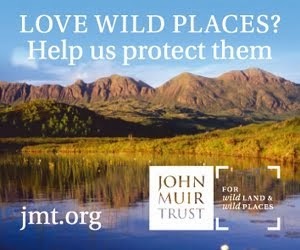 How little wild land we have and yet it is threatened by an industry that is debatable in its cost and effectiveness. A good reminder Chris of the landscape that is under threat. I wonder if there where more Munro's in the heart of the Monadhliath would there be more outcry and rage about the wind farms?. 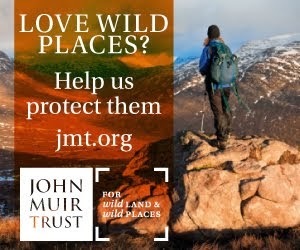 Moorland is just as important as high mountains and needs to be saved. Well done to you and Alan in the efforts to stop the wind farms. Great post, Chris, as ever. Looks like we hill-walkers are standing in the way of the epoch-making plans by the Glorious Leader. 10,000 thousand years, where have I heard that before? I hope we slow down or stop the building of these wind farms in our lovely countryside. I would like to read an honest and unbiased viewpoint on the financial benefits to developers, land owners and the tax payer. I get the impression that everyone involved wins very well financially except for the tax payer, but surely not, the Scottish Government wouldn't allow such unfairness would it ? I quite like the visual appearance of windmills, in the right place and in moderation. Although I certainly wouldn't want to see them in our most picturesque and wild landscapes. We all use electricity and a lot of people waste electricity. In general, outdoor people want to protect the wild environment, so perhaps we should do more to promote less electricity usage amongst ourselves and the general public. After all, if we used less electricity maybe we would not need this windfarm. Another question is what alternative solutions are there to generating electricity? Personally I would like to see a government programme of widespread installation of solar panels on flat and south facing roofs across the UK, particularly in the south east of England. Other solutions include off-shore windfarms and micro generation projects such as turbines in small streams. Does anyone else have any suggestions?